This page provides a brief guide for visitors to the town of Otley in the area of West Yorkshire (north England) called Wharfedale. In 2001 the population of Otley and Wharfedale was about 24,000. 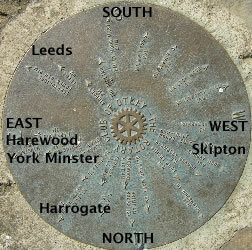 It is six miles from Ilkley and 10 miles from Leeds. 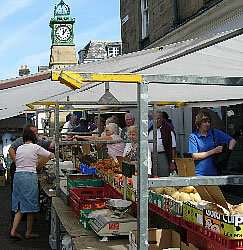 Otley has a traditional outdoor market each Friday and Saturday, and there is a farmers' market selling local produce from 10am-2pm on the last Sunday each month (except in December, when it is earlier in the month). Cattle auctions take place on Tuesdays and on some Fridays. There are special events and festivals throughout the year. These include the Otley Show (an agricultural show) in May, Otley Carnival in June, Otley Black Sheep Folk Festival in September, and a Victorian Fayre in December. Visitors can enjoy the many local pubs and tearooms. The oldest inn in Otley is The Black Bull in Market Place. It is said that Oliver Cromwell's soldiers drank here after they camped outside Otley on the day before the battle of Marston Moor in 1644, during the English Civil War (they went on to win an important victory over the Royalists). 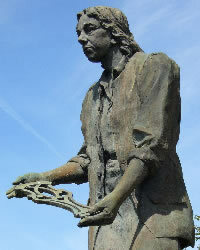 Thomas Chippendale (1718-1778) was born at Otley. He was a funiture maker who is particularly famous for some of his rococo-style designs. A blue plaque and statue have been put up at the end of Bridge Street. In 1754 he published a book called "The Gentleman and Cabinet-maker's Director". Thomas' son (also called Thomas) continued his father's work. Some original examples of Chippendale furniture can be seen at Harewood House and Temple Newsam (two large country houses near Leeds). 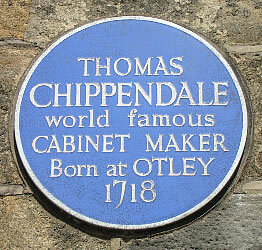 You can learn more about Chippendale's life at the Otley Museum. This also contains an early example of a Wharfedale Printing Machine, a new type of printing press (invented in Otley in the mid-19th century) which revolutionised the industry. 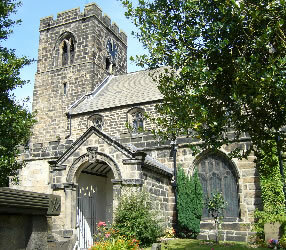 Thomas Chippendale was baptised in the local Anglican parish church (All Saints) in 1718. This church dates from the 11th century, although this location was used as a place of worship for several hundred years before this. 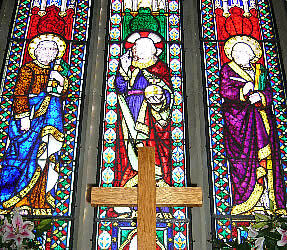 One of its most attractive features is its stained glass East Window, created in 1851. The River Wharfe flows through Otley, and there is a park next to it called Wharfemeadows Park. This is an attractive place to enjoy an easy walk or to eat a picnic. 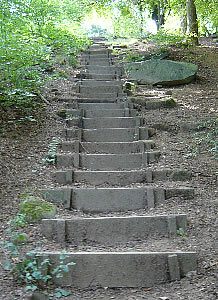 On the south side of Otley is a nature reserve called Chevin Forest Park. You can walk from the town centre up a ridge called Otley Chevin to a place known as Surprise View, from where there are excellent views of the Yorkshire countryside. 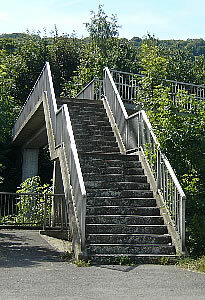 To get to the top you need to climb a very steep path so you need to be fit to attempt this - it takes maybe half an hour to walk up and half of this time to go down again. Surprise View can also be reached by road (there is a car park on Yorkgate). The English painter William Turner visited Otley in 1797 (aged 22) to paint watercolours of the area. 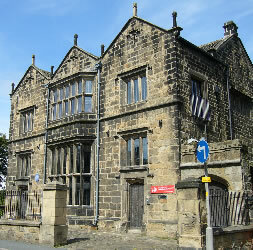 He often returned to stay with his friend at nearby Farnley Hall. A storm over Otley Chevin in 1810 inspired his painting "Hannibal crossing the Alps". The top of the hill is known as "Surprise View"
Otley and Wharfedale may look familiar to you if have watched television in the UK. 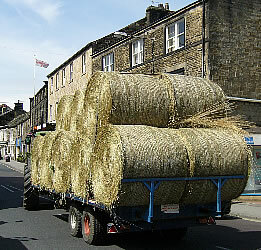 The soap called Emmerdale is set in Lower Wharfedale. 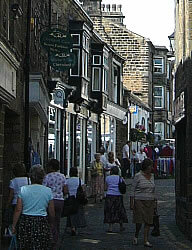 Some of the filming takes place in Otley, which is known as Hotten in the programme. The series Heartbeat is set in a fictional town called Aidensfield in the 1960's - it is mostly filmed in the village of Goathland in the North York Moors, but the police station scenes are filmed in Otley. - There are frequent buses to Otley from Leeds, Bradford and Harrogate. The journey time is about 1 hour. Buses stop at Crossgate (map). - There is a linking bus service from the nearby railway station at Menston (1 mile from Otley).